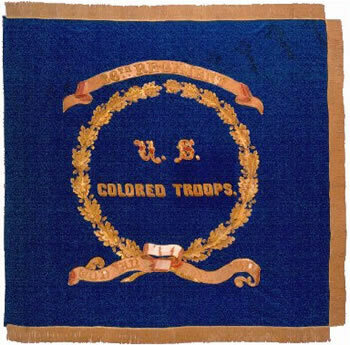 During the Civil War, many military units had their own regimental flags that they would carry into battle, and this was true of units in the United States’ Colored Troops. On the third day of the month, I’ll display a flag from each of those regiments – depending on my ability to find these flags through internet searches and other sources. 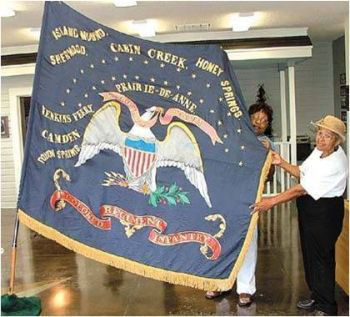 These ladies are holding a replica of the regimental flag for the First Kansas Colored Infantry. A larger image of the flag is here at the site for the Kansas Historical Society. The First Kansas Colored Infantry is one of the most historically significant regiments in the war, although it is less well known than the 54th Massachusetts (depicted in the movie Glory) or perhaps the Louisiana Native Guard/Corps D’Afrique. At the start of the Civil War, the Union government did not use blacks as soldiers, for various legal and political reasons (see a discussion of these reasons here and here). But that wasn’t a show-stopper for the people of Kansas and its U.S. Senator, James Lane. Kansas began the recruitment of blacks into the state militia force during the summer of 1862. Some of these black men were fugitive slaves from next-door Missouri (Lane and others are reported to have gone on slave raiding parties into that state); several hundred were from Kansas’s Indian Home Guard. Whatever the source, the result was the formation of the First Kansas Colored Infantry, the first African American regiment raised in the Northern states. 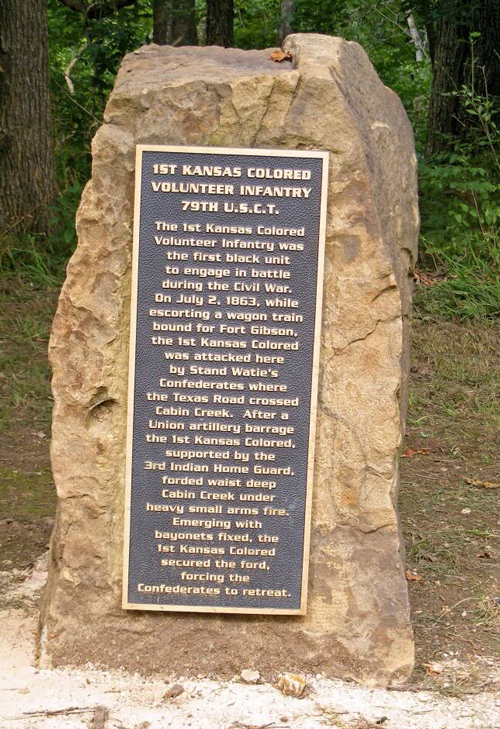 Although the 1st Kansas was not formally accepted into the federal army until January 13, 1863, the First Kansas Colored was among the first African American regiments to see fighting. Five months passed before the First was accepted into federal service, but this did not deter them from training or seeing action. On October 28, 1862, a detachment of 225 men faced 500 Confederates at Island Mound in Bates County, Missouri. Ten members of the First were killed and twelve wounded, but the Confederates were driven off. The worst day in the First’s Civil War record came on April 18, 1864, at Poison Springs, Arkansas, where 117 died and 65 were wounded. The death toll was aggravated by the Confederates’ execution of captured and wounded men left on the field. For black soldiers in the west, “Remember Poison Springs!” was a battle cry for the remainder of the war. 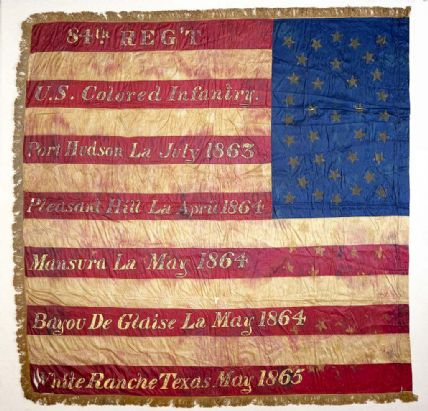 The preserved regimental flag of the First Kansas Colored Infantry documents the unit’s gallantry. Recorded on it are the battle honors of Island Mound, Cabin Creek, Honey Springs, and Poison Springs, as well as the battles of Sherwood, Prairie Deanne, Jenkins Ferry, and Camden. 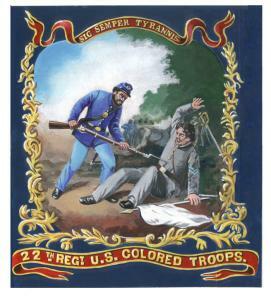 The First Kansas Colored Infantry was organized into the USCT as the 79th Regiment Infantry (New), on December 13, 1864. • Memorial at the Fort Scott National Cemetery, Kansas. • Memorial at the Cabin Creek Battlefield near Pensacola, Oklahoma. 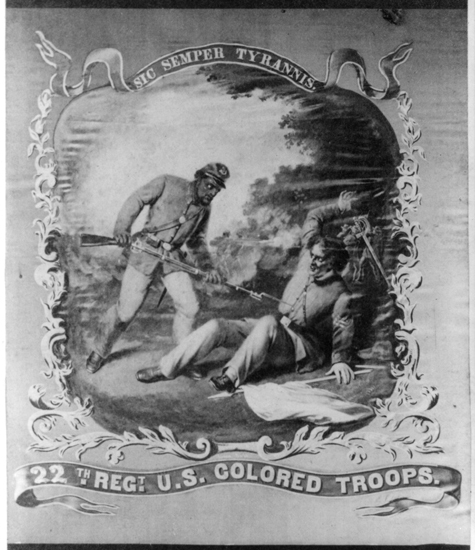 This is the regimental flag for the US Colored Troops 26th Regiment Infantry, New York. The motto at the base of the flag is “God and Liberty.” Source: New York State Military Museum. These are the national colors for 26th Regiment. Source: New York State Military Museum. According to the NYS Military Museum, this regiment was organized at Riker’s Island, New York on February 27, 1864. It served in the Department of the East to March, 1864; in the District of Beaufort, Department of the South, to April, 1865; at Port Royal, S. C., until it was honorably discharged and mustered out, August 28, 1865. More details about the 26th USCT are at the here at Civil War Archive.com. The homepage for the New York State Military Museum is here. 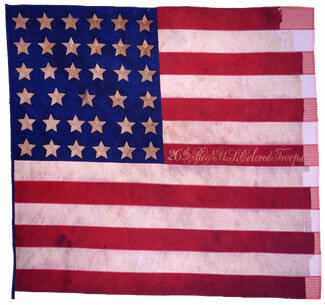 During the Civil War, many military units had their own regimental flags that they would carry into battle. The units in the United States’ Colored Troops developed their own “battle flags.” On the third day of the month, I’ll display a flag from each of those regiments – depending on my ability to find these flags through internet searches and other sources. SERVICE. (as 12th Regiment Infantry of the 12th Corps de Afrique Infantry, through April 1864)–Garrison duty at Port Hudson until April, 1864. Expedition to Grand Gulf February 15-March 6, 1864. Designation of Regiment changed to 84th United States Colored Troops April 4, 1864. SERVICE.–Red River Campaign March 10-May 22. Advance from Franklin to Alexandria March 14-26. Retreat from Alexandria to Morganza May 13-20. Mansura May 16. Near Moreauville May 17. Yellow Bayou May 18. Duty at Morganza until May, 1865. Action near Morganza November 23, 1864. Duty in Northern District of Louisiana and Dept. of the Gulf to March, 1866. Mustered out March 14, 1866. A discussion of Louisiana Colored Troops is here. During the Civil War, many military units had their own regimental flags they would carry into battle. 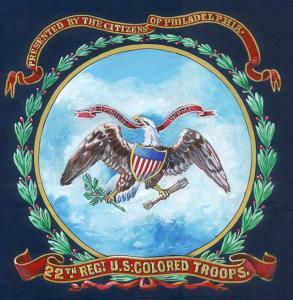 The units in the United States’ Colored Troops developed their own “battle flags.” This is the flag for the USCT 24th Regiment, Pennsylvania. This flag was designed by David Bustill Bowser, an African American artist from Philadelphia who also created several other designs for USCT banners. He also painted Lincoln and a famous portrait of John Brown. 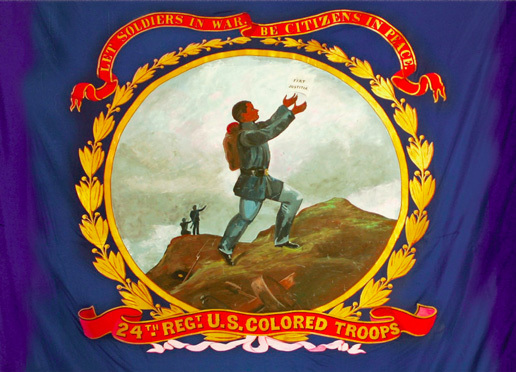 The flag reads at the top, “Let Soldiers in War Be Citizens in Peace.” The regiment members were proclaiming that, just as they recognized their citizenship obligations by fighting for the Union; so too did they expect to receive the benefits of citizenship from the Union, such as black suffrage and other political and legal rights.